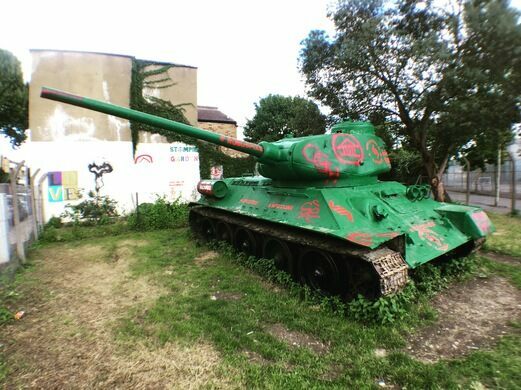 An abandoned tank sits in an empty London lot as a symbolic middle finger to local city planners. Abandoned since 1995, the Mandela Way T-34 Tank (or “Stompie,” as it has been affectionately nicknamed) is a strange war relic that is the product not of a national conflict, but of a fight between a businessman and city planners. This former medical factory gives home to cutting edge arts in the shadow of a gas works. The tank is though to have originally been used by the Czech military during the fighting of the Prague Spring in 1968, but was brought to London in during the filming of the movie, Richard III. The iron coffin was placed in the empty lot in 1995 after it was purchased by local businessman Russell Gray. The property developer had wanted to build on the empty lot, but his proposal was shut down by the city council. 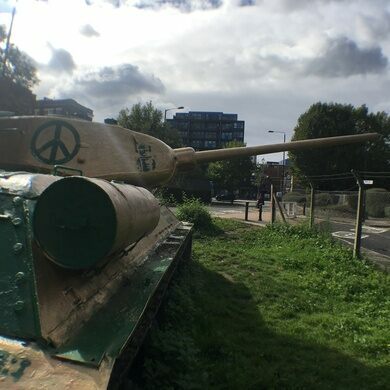 So under the auspices of giving his son a military-grade toy to play with, Gray bought the tank and placed it in the empty lot with the cannon pointed rather conveniently in the direction of the Southwark Council’s planning offices. Stompie still sits on its Mandela Way lot to this day, surrounded by scrub and weeds. In recent years the tank is usually completely wrapped in a works of graffiti, often with some political message. However the existence of a tank that is essentially a giant middle finger to a local council is maybe the funniest statement of all. The fences outside some of South London's estates are made from recycled World War II stretchers. An abandoned logging settlement nestled in the woods near a popular ski town. This imposing 20th-century castle was abandoned before it was ever completed.